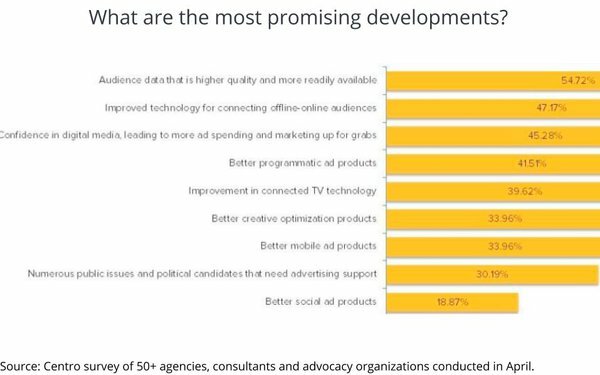 That’s what political media-buying and advertising operatives at ad agencies involved in the 2016 midterm elections campaigns said when asked by digital advertising and media-buying technology firm Centro surveyed them about their views on political media campaigns recently. Centro, which helps manage numerous political and public affairs campaigns for agencies and clients, regularly surveys its community to understand what’s on their minds, and conducted a survey of more than 50 agencies, consultants and advocacy groups in April to inform its new report. “The second-highest response,” says Briscoe, is ‘improved technology for connecting offline-online audiences’,” which she says speaks to some underlying concerns about the confidence in data. Asked what their biggest concerns were leading up to the 2016 midterms, two-thirds of the respondents cited a perennial issue -- “proving advertising impact to clients” -- but some cited legal issues from the 2016 elections.